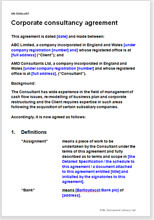 This document is suitable for any business which calls itself a consultancy. Of course your industry sector affects the work you do. But this is a legal document, so does not specify the work you do. This contract is for a corporate consultancy to present to any client as its contract. See below for alternative consultancy contracts. It may be edited either by you before you submit it, or in negotiation with your client. It is drawn to protect you, the consultancy, but should also be acceptable to your clients. There is an option for work by accountants or surveyors or others to work on behalf of a bank or other lender, where this is your contract with the debtor company. This is an “umbrella” contract, set up for the possibility of future assignments under the same terms. That way, if you want more work from the same consultant, all you have to do is define it and refer to this agreement. Even if you expect never to enter into a new work assignment, you do not have to delete anything on that account. If your business is IT related, you may prefer the version with additional relevant paragraphs relating to IP protection at IT consultant contract: corporate; full. Other choices are listed below. Additional provision to cover your relationship with a bank if you have been appointed by an administrator or liquidator. There is little statute law in this consultancy agreement. It depends on basic contract law and tort. for the client of a consultant to offer to a consultant, to protect his own interest. Over 2,500 words of helpful and informative drafting notes.